In keeping with its mandate to provide the best care experience for older Ontarians, the Ministry of Health and Long-Term Care regularly monitors several aspects of senior care in provincial long-term care facilities. Four of these areas, referred to as “health quality indicators,” are reported on the Health Quality Ontario website, and highlight those that are being managed well and those that need improvement. McCormick Home’s latest results for the four areas measured, including the treatment of pressure ulcers, use of restraints, incidents of falls and treatment of incontinence, are now available. We are pleased to share these results with you, along with some information on how these results contribute to our efforts to continually enhance the quality of care we provide. 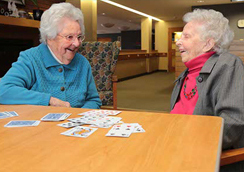 At McCormick Home, the care and safety of our residents is our first priority. We are committed to quality improvement that leads to better resident health and safety and better care performance, and we value Health Quality Ontario’s public reporting effort as an important tool that can be used to inform our quality improvement activities. We hold ourselves to a high standard and strictly apply the ministry’s definitions related to the four health quality indicators. In addition, we continually strive to better understand the ministry’s measurement and reporting criteria as they evolve. As such, our results, and those of other long-term care facilities, sometimes vary considerably from one quarterly reporting period to another, impacting on the averages reported. Please bear with us as we continue to work through this process, and know that we are committed to providing you with clear and understandable information that best articulates how our results impact those in our care. As always, your comments and questions are welcome. While our numeric results are important to ensuring that we maintain a high level of quality in the services we provide, our focus remains on the individual experiences of care we provide to each of our residents at any given moment. We believe strongly in the importance of person-centred care and practice a philosophy that focuses on individual personhood and dignity in the services we provide. In addition, we recognize the important role that family members play in the health and wellbeing of our residents. We understand the need to respect a family’s wishes when they make important decisions on behalf of their loved one, and we work to ensure they remain an integral part of our residents’ plan of care. Since 1985, McCormick Home has been voluntarily participating in rigorous reviews conducted by Accreditation Canada to ensure compliance with quality care practices. In 2015, McCormick Home received an Exemplary Standing, the highest possible rating from Accreditation Canada, which conducts these reviews every four years. If you have any comments or questions, please contact Tanya Pol, Administrator, at tpol@mccormickcare.ca or 519-432-2648 ext. 2321. People are living longer, which means that there is an overall increase in residents who are admitted to long-term care homes with pre-existing conditions, such as incontinence or pressure ulcers. An October 2012 report from the Ontario Association of Non-Profit Homes and Services for Seniors states that of the current residents in long-term care, 99% cannot eat alone, 99% cannot dress alone, 97% need help toileting and 95% are incontinent. The results reported for 2013-14 reflect the rolling average of the four quarters ending March 31, 2014. In 2013-14, 17.6% of McCormick Home residents experienced worsening incontinence, below the provincial average of 19.5%. McCormick Home understands the importance of addressing incontinence in a dignified way and employs a comprehensive toileting program. 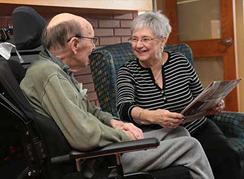 The home evaluates each resident upon admission for usual toileting patterns and then establishes an individualized program of continence care that includes orienting a resident to bathroom locations, maintaining adequate fluid intake, supporting the resident at each bathroom visit, providing frequent and regular opportunities for bathroom use, and providing appropriate continence care products. In 2013-14, McCormick Home employed restraints in 8.5% of resident cases, below the provincial average of 8.9%. Although we use the term restraint, we mean to convey an attitude of least restraint; that is, affording the resident the most freedom possible, yet offering the safety they require. For example, seatbelts in wheelchairs and lap trays (for meals or activities) are considered “restraints” unless they can be removed by the resident themselves. It is important to note that these types of devices enable a resident to have more independence and participate more fully in their self care (e.g. eating a meal) and in recreational activities or other activities of daily living. As such, some assistive devices, which are defined as restraints, are important to promoting resident independence. 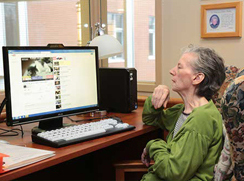 McCormick Home is committed to complying with the Long-Term Care Homes Act (2007) legislation, aimed at minimizing the restraining of residents and specifying when and how physical devices are to be used in the home. It is important to know that restraints are not used on any resident unless they have been recommended by a licensed physician and agreed to by the resident’s family/substitute decision maker. In addition, our restraint policy is reviewed annually with all staff as part of the annual education/training review. Training is provided to staff on application, use and associated risks of using restraints. We acknowledge that there are rare occasions when residents may need to be restrained for their own protection if they are experiencing impaired judgment and/or loss of self control. In 2013-14, 2.4% of residents at McCormick Home experienced a pressure ulcer that recently got worse, below the provincial average of 3.0%. Pressure ulcers are wounds that are caused by constant pressure or friction on an area of skin. This includes any kind of blister experienced by a resident. McCormick Home recognizes the importance of preventing pressure ulcers from starting as well as employing methods to heal them quickly. We follow best practice guidelines in wound treatment as established by the Registered Nurses Association of Ontario. McCormick Home employs a skin care expert on site as well as a nurse practitioner who is certified in skin and wound care. The home also works with an outside consultant who specializes in skin care. We also recognize that there are situations where individual choices by either the resident or family may not support the physical healing of pressure ulcers. In such instances, these same choices often promote a resident’s emotional, spiritual or cognitive health and wellbeing. In 2013-14, 12.0% of McCormick Home residents recently had a fall, below the provincial average of 14.2%. A fall is defined by the Ministry of Health as “an unplanned change of position from a higher to lower level.” McCormick Home strictly applies the ministry’s definition of a fall. This includes reporting all occurrences, such as a resident’s sudden shift in position while remaining seated. A resident does not have to land on the floor to be considered as having fallen. At McCormick Home, keeping residents safe from falls and fall-related injuries is a priority. We are committed to ensuring that all falls are reported accurately and promptly, and according to ministry guidelines. In addition, a person’s ability to make choices when it comes to safety is carefully balanced with the need to keep them from harm. McCormick Home proactively manages the prevention of falls by assessing each resident for their fall risk level and identifying a customized care plan that outlines ways to prevent falls. Families are notified about the care plan and are asked to consider supporting the suggested strategies that are not covered by OHIP, such as hip protectors and non-skid footwear. 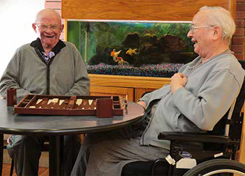 McCormick Home places a high priority on keeping residents active and independent for as long as possible, while maintaining a safe environment. A key aspect of this effort involves our Nursing Restorative Care Program, a customized care plan designed to maintain or restore a person’s ability to participate fully in daily living activities. Participation in this program exposes participants to a higher risk of falls, but enables them to experience the benefits of exercise and enhanced independence.